Features: In-Wall / In-Ceiling Home Speakers Active Passive Speaker System Built-in Bluetooth Wireless Receiver Universal Flush Mount for Any Flat Surface Flat & Thin, Slim-Style Removable Speaker Grill Convenient Magnetic Speaker Grill Quickly Attaches / Detaches Digital Sound Processing Amplifier Ability to Connect External Devices RCA Audio Aux (L/R) Connectors 2-Way Full Range Stereo Sound Reproduction 1/2'' High Compliance Polymer Tweeter Polypropylene Cone with Rubber Edge Cut-Out Template for Easy Installation Integrated Clamp-Type Mounting Brackets Environmentally Friendly ABS Construction Perfect for Custom Audio Applications Used for Home, Office & Business What’s in the Box: (1) 6.5’’ -inch Active Speaker (1) 6. A great choice when space is limited. The flush mount design provides a nice clean look. 2-Way Stereo Sound Speakers. 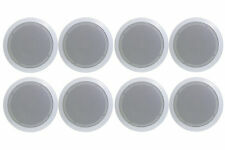 Mounts Flush in Walls or Ceilings. 1" High Temperature Voice Coil. The Music Masters. Details about Enrock Marine 6.5" High Performance Speakers (Black / White / Charcoal). Details about Enrock Audio Car / Marine 50 Foot Installation Speaker Wire. You're therefore eager to actually have it, see it, and hold it in your very hands. Excellent for Monitor or Surround Sound Applications. 6.5" Long Throw Woofer. Spring Loaded U Mounting System. Heavy Duty ABS Construction Cabinet w/Rubber Edges. Frequency Response: 30Hz-22kHz. Pyle PDICBT87. Mount the speakers in a convenient location on flat wall or ceiling panels for a flush, clean look. Achieve wide-range sound performance and add audio to any room with the Pyle In-Wall / In-Ceiling Bluetooth Speaker Kit. 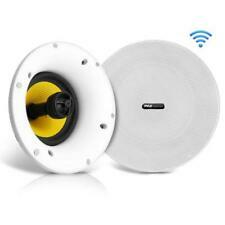 Pyle Home Indoor-Outdoor Wall-Mount Bluetooth Speaker System White - 5.25 in. The Pyle 5-1/4 in. Indoor/Outdoor Wall-Mount Bluetooth Speaker System provides high-powered wireless Bluetooth performance, indoors or out. Featuring rugged marine-grade waterproof construction, they are the perfect choice for adding full-range stereo sound on boats, decks or backyards. 5 out of 5 stars - Pyle Home Indoor-Outdoor Wall-Mount Bluetooth Speaker System White - 5.25 in. 4 product ratings4 product ratings - Pyle Home Indoor-Outdoor Wall-Mount Bluetooth Speaker System White - 5.25 in. 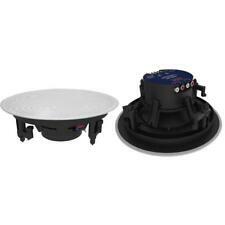 Includes (1) active and (1) passive 3.5” 3-way indoor outdoor speakers. BLUETOOTH CONNECTIVITY: The weatherproof integrated loud speaker system is equipped w/ Bluetooth wireless music streaming. 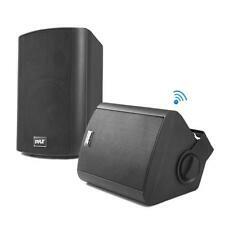 The Pyle PDWR54 mountable speaker systems provide high-powered wireless Bluetooth performance -- indoors or out! Featuring rugged marine grade waterproof construction, they are the perfect choice for adding full range stereo sound on boats, decks, patios or backyards. WiFi Wireless Music Streaming Ability. Bluetooth Wireless Music Streaming. Built-in Bluetooth for Wireless Music Streaming. WiFi Wireless Range: 98’ ft. Bluetooth Connectivity Bluetooth Version: 4.0. Mount the speakers in a convenient location on flat wall or ceiling panels for a flush, clean look. Achieve wide-range sound performance and add audio to any room with the Pyle In-Wall / In-Ceiling Bluetooth Speaker Kit. Pyle PDICBT852RD. You will be able to stream audio from all of your favorite Bluetooth devices (like smartphones, tablets and computers). Mount them in a convenient location on the wall or ceiling for a flush, clean look. Features: In-Wall / In-Ceiling Speaker System Universal Flush Mount for Any Flat Surface Flat & Thin, Slim-Style Removable Speaker Grill Convenient Magnetic Speaker Grill Quickly Attaches / Detaches 2-Way Full Range Stereo Sound Reproduction 1/2'' High Compliance Polymer Tweeter Polypropylene Cone with Rubber Edge Cut-Out Template for Easy Installation Integrated Clamp-Type Mounting Brackets Environmentally Friendly ABS Construction Perfect for Custom Audio Applications Used for Home, Office & Business What’s in the Box: (2) 6.5’’ -inch Speakers (2) Magnetic Speaker Grills Cut-Out Template Technical Specs: Power Output: 480 Watt MAX Speaker Type: Passive Speaker Style: Round / Circle Frequency Response: 70Hz-20kHz Impedance: 8 Ohm Sensitivity: 89 dB Cut-out Diameter: 7. Select Disco Jam systems feature cross compatibility that allow you to use the speakers individually or connect them to your current audio setup adding an active or passive speaker. Disco Jam speakers make for the perfect Karaoke parties and performances. These speakers pump out up to 250 watts max and are sold as a pair. 6.5" Midbass Speakers. 1" High Temperature Voice Coil. 250 Watts Rated Peak Power.